These rocks alongside US101 and the Russian River are a great place to swim, fish, boulder, or just chill out. There are also a few short sport routes. The word squaw is an Algonquian word meaning woman. Squaw Rock got its name from the legend of a girl who was not allowed by her tribe to be with the man she loved so she jumped off the rock to her death. 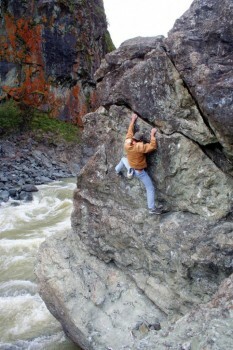 Two main bouldering areas are within a quarter mile of each other and have easy access from pullouts alongside US-101. Unfortunately, most of the good boulders are across the river and can usually only be accessed in late summer or fall when the river is low enough to cross. There are many places to cross that change seasonally as rocks and sandbars come and go. The best crossing spots are marked on the map. Which SuperTopo guidebooks cover Squaw Rock? Marcos Nunez high over the Russian River on Cracker (V0R/X).